This is the second part of my series about JavaFX architecture and best practice for (business) application. You can find the first part about middleware here. In this post I will show you a simply and modern way to bind your data model to your view by using Context Dependency Injection (CDI). If the Controller will be created by a CDI-Container the model field will be injected. This means that the CDI-Container will fill the field with a suitable instance of Model. How this model is created is not part of the Controller class. The controller only knows that he will get a injected instance of Model and can work with it. In a normal business application you will have views and workflows. For example you will have a overview of some important business values and a form dialog with CRUD functions. Normally you will define your views by code or with the Scene Builder. If you use the Scene Builder you can transfer all your UI code into the fxml file and handle the logic inside a controller class. The controller can now access the business data by calling data stores or any other of your classes. The controller has hard dependencies to you business data classes. 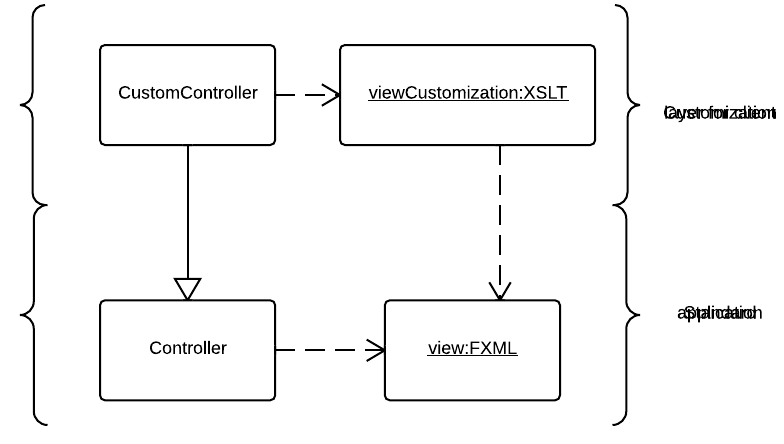 The controller class is defined inside the fxml file. Providing special business object instances only for one view workflow isn’t easy. I will try to solve this problems with a new approach of JavaFX client development. FXMLHelper.create(..) is a Method that I created to do some magic (Don’t be afraid, I will release a code for this design pattern later). The method creates the controller instance and the view and bind them. We can now easily add the node to our scene graph. Right, cause we don’t need it 🙂 Cause now comes the CDI magic. A first project that shows the use of CDI in JavaFX is afterburner.fx by Adam Bien. With this framework you can easily inject objects in your JavaFX controller. But this framework is very lightweight and don’t support all default CDI features. There are no producers, scopes, etc. In this example the model has a custom Qualifier annotation (@ModelQualifier). This will define a special Model type. This type is created by the ModelFactory. The getModel() method has a @Producer annotation that defines this method as a producer for the model class. Additionally the init() method of the controller has a PostConstruct annotation. This method will automatically called once a controller is created. The FXMLCDI util class (my custom one) handles all the FXML and CDI stuff. Cause CDI is mostly used in JEE context at the moment most of the Scopes don’t fit to a JFX application. But we will need Scopes here, too. In the default CDI Scope a new instance of a class is created for every injection. Secondly you can use a singleton scope. By doing so only one instance of the class will be used in your application. All other default scopes are related to web applications (RequestScope, SessionScope, …) and won’t fit in a JavaFX application. While looking at other frameworks I found some interesting scopes that are part of ADF. Here you can use a ViewScope and a ViewFlowScope. I think this scopes are very useful for client applications and one of my next steps is the integration of this scopes in my FXML/CDI Framework. And how can I use this stuff? I would like to see how you hooked up Scopes for FX, Im a Seam JSF2 developer by day, but have been playing with an FX port of my site and using CDI and scopes in FX will be AWESOME! The sooner you can gather feedback the better I believe. Thanks anyhow for this wonderful article. Thanks for all the feedback. I currently checking some CDI ideas and workflows with Johan Vos. I hope to post a update next week. I have to write a JavaFX framework which will let me to customize my application for certain clients. I don’t want to go for a full module system like OSGi because I don’t see the need for larger ecosystem with 3rd party developers around my application. I just need a more classic and easy to maintain layered approach. Would you like to collaborate on something like that ? can you explain your concept a little more? Lets say you’ve build a business application using your pattern with JavaFX and CDI. It’s ok, nice, some clients use it out-of-the-box. But from time to time other clients want to customize it – make some changes in the GUI and its behavior that would not be welcomed by other clients. You could always make a branch in git and change the code directly. But this will be a pain to maintain when you’ll have to do an upgrade to the custom app and merge it with the mainstream release. You could also go for a full blown module system like you have in Eclipse or Netbeans. But those systems in most cases only let you add new GUI components easily. There is now easy way for module A to modify the components of module B and their behavior. Besides module systems add a lot of complexity like dependency management, over-encapsulation, dependent jar management and versioning. A more simple and old-school approach is adding a customization layer (one per client) over your application in a separate jar, which will use the mainstream jar. You can easily extend controllers and tell CDI to inject your custom ones everywhere instead of the standard ones. But what about extending the GUI described in FXML ? I think the best solution would be to use a XSLT transformation associated with a custom controller to add/change what you need. Okay, I am very interested in this and would like to echo the call for source code! I am new to java and still learning about all of these technologies, so it is more difficult for me to connect the dots without the source code. I searched through the rest of your blog, which is very nice, but I did not see any followup posts. I would love to learn more about your approach and take a look at the source, no matter how messy!